Written by the celebrated Cole Porter and made famous by iconic crooner Frank Sinatra, the tune I’ve Got You Under My Skin is a favorite of multiple generations of men and women. But each May, our focus is on something decidedly less romantic going on under the skin. May is national Skin Cancer Awareness Month. And with good reason, as Americans are shedding their winter garb and donning sundresses, tank tops and swimsuits instead. But all that summer sun-soaking comes at a grave risk. According to the Skin Cancer Foundation, Skin cancer is the most common form of cancer in the United States. More than 3.5 million skin cancers in over two million people are diagnosed annually – more new cases each year than breast, prostate, lung and colon cancers combined. 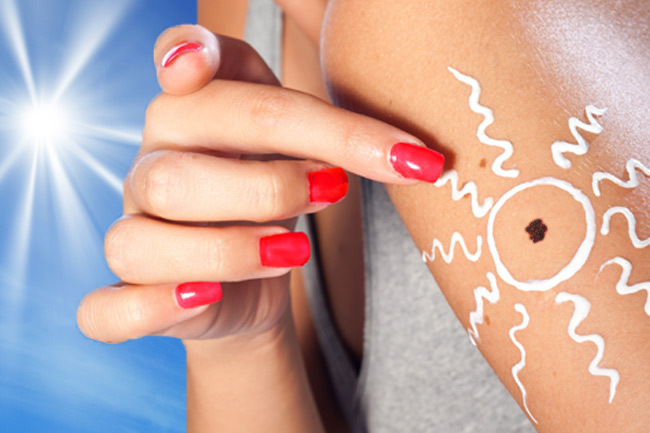 “One in five Americans will develop skin cancer in the course of a lifetime,” warns Associates in Dermatology founder and skin cancer specialist, Michael Steppie, MD. Simply put, skin cancer is the uncontrolled growth of abnormal skin cells occurring when unrepaired DNA damage to skin cells (usually caused by ultraviolet radiation from sunshine or tanning beds) triggers mutations that lead the skin cells to multiply rapidly and form malignant tumors. While that “sun-kissed” look has long been popular, many fashion and celebrity media outlets today are promoting a trend toward a “moonlit” ethereal look – smooth, firm, more youthful skin that bears a more natural, non-tanned look. In fact, we’re seeing more celebrities shun the sun as they realize how the sun’s damaging rays not only limit their careers as their skin begins to lose its luster, but more importantly, place them at risk for skin cancer. That’s an incredibly positive move, as celebrities have such powerful influence on Americans’ choices. In fact, skin cancer is widely considered a “lifestyle disease,” meaning that it’s largely a result of our day-to-day lifestyle and skincare choices. That’s why Associates in Dermatology has sponsored FOX Weather’s UV index for three consecutive years. Daily exposure to both UVA and UVB rays speeds up aging of the skin and boosts your risk of skin cancer. UVB rays, often referred to as the sun’s “burning rays,” are shorter than UVA rays. Their intensity varies depending upon the season, the time of day, altitude and distance from the equator. UVA or “aging” rays are longer and more constant year-round. They penetrate nearly twice as deep into the skin. The UV (“Ultraviolet Ray”) Index” is a measure of the amount of sun-damaging UV radiation that is active at a given time in your region. It uses a numerical scale to rate the strength of the sun’s UV exposure level. The higher the UV Index level, the greater the strength of the sun’s UV rays – and the faster you can burn! Still, be aware that exposure to the sun, even on cooler, overcast days can damage your skin. To keep your skin smooth, healthy and beautiful, call 800-827-SKIN (7546) to schedule a consultation with one of Associates in Dermatology’s skin cancer and skin care specialists. For more tips on playing it safe in the sun, and more details on the UV Index, see a past article Dr. Steppie penned in Central Florida Lifestyle magazine (July 2011).